Here is a pumpkin soup recipe to keep you warm on a cool, autumn day. It is extra delicious because I add coconut milk to it and it gives it such a yummy flavor! You can make a big pot of it than tuck away some portions in the freezer for easy lunches and dinners. Cut the onion finely. Heat up a large sauce pan over medium heat. Add the olive oil to lightly coat the pan then add the chopped onions. Saute until they are soft and translucent (add water if needed to keep the pan from getting too dry). Add the minced garlic and spices and stir for 30 seconds. Add the pumpkin cubes and stock. Bring to a boil and then turn to low and cover for 30 minutes. Allow the soup to cool and then blend it with a immersion blender or in batches in a blender. Do taste the soup and add more seasoning as desired. Once it is pureed, return it to the pot and add the coconut milk and mix through. This soup freezes really well so you can make a big batch and then enjoy over the month. In the picture above I added creamed corn to the soup and topped it with parmesan. 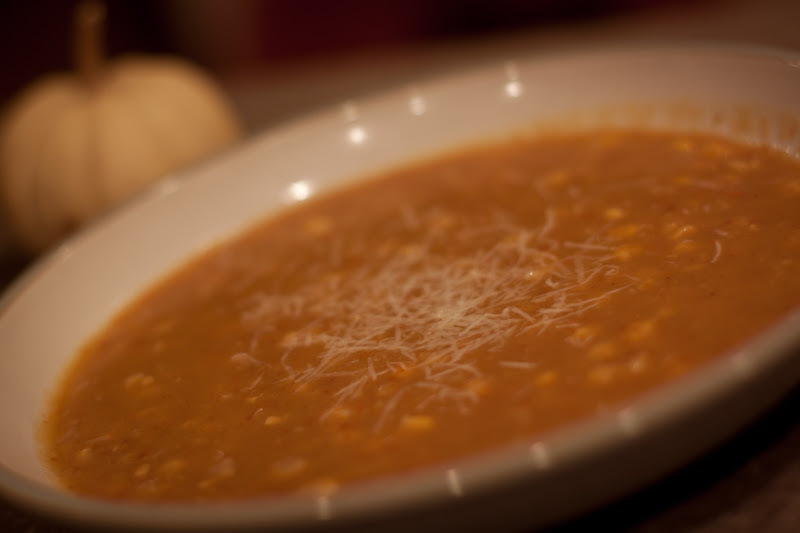 We often serve the soup with rice, cornbread, or tortilla chips. Also, don't throw out those pumpkin seeds. You can bake them for a yummy, crunchy treat. Separate the seeds from any strings and then pat them dry with paper towel. Mix them in a bowl with 3 tsp of olive oil. Spread them out in a thin layer on a baking tray. Season them with salt. Bake for 45 minutes at 300 F (150 C) stirring occasionally. No Response to "Pumpkin Soup"